I love getting my science on, and reading the cleverly named Gulp - Adventures on the Alimentary Canal by Mary Roach recently enabled me to do just that. Mary Roach takes the reader through the entire digestive process, from smell, taste, saliva and what happens in the stomach to noxious flatus and the colon. The science of the human body is explained and discussed in layman's terms with a sense of humour and case studies that often left me gagging for more. A grazing cow can produce a hundred gallons of methane a day, vented, as stomach gases typically are, through the mouth. Page 228. I didn't know that they were vented through the mouth, I thought they were emitted as gas!! Roach lifts the lid on the production of pet food, the purpose of saliva and more (you'll be shocked to learn how much saliva you swallow in a day). I could go on and on, but I think you get the drift. 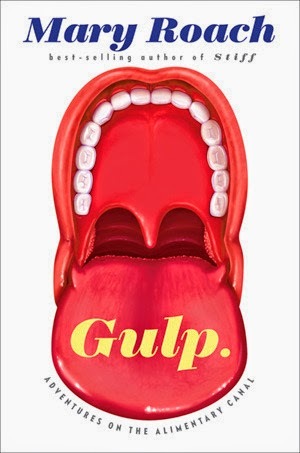 Gulp is a funny, educational and thought provoking read that takes a good look at the gross and the taboo inside the human body and I loved it. All puns in this review were intentional. Buy your own copy of Gulp from Boomerang Books. Wonderful, thanks Carole, let me know if you enjoy it. Roach has written a few popular science books - I have them all my TBR wishlist, but it sounds like this would be a good one for grossing out the boys at the dinner table with!! Hi Brona, you'll definitely find plenty of facts with which to gross out your boys while reading Gulp. I also read Stiff, but enjoyed this one more.